So, Autumn is officially here, (well, here on Northern hemisphere), and I am officially hating it. I hate wearing sweaters, socks, jackets, boots, (ok, I love boots, but nvm). At least, on Stardoll I can pretend it is still Spring/Summer and dress my doll accordingly. Speaking of Stardoll, I am still enjoying the update, one of the best things Stardoll introduced, like, ever. But let's see what we got last week. It started with limited release - I am talking about Monday, and new Antidote mini collection. I am not sure why we got a mini collection - only 2 windows in starplaza home page. We never had Antidote mini collections. Speaking of items, it appears they sold really fast. I am not sure how, as the collection did not appealing to me at all, but I guess many have different taste from mine. I just dislike fur, and gold, and the overall shapes, patterns and designs on items. Sure, there are few items I kinda liked, but not worth renewing my ss membership yet. Anyway, I see many have made some really great outfits using the items from the collection, so good for you. Recently, Stardoll has updated bazaar by adding more stores in main bazaar search function. This is beneficial for both buyers and sellers, as you can find items to buy easier, and people who sell their stuff can have them found more easily by others. I haven't really used it though, as I prefer to buy from starplaza, but I am really happy for the update as hopefully it will get easier for me to sell stuff. They really worked hard and added a nice amount of brand, and considering they are still tweaking bugs and adding updates for out closet, along with releasing new stuff constantly, well seems like Stardoll staff are really taking the job seriously. And I salute them for that, along with, I believe, many others. On Tuesday, Stardoll released another mini collection - this time: one window, all starcoin items - I am, of course, talking about MSW Wild Candy Couture collection. I was really looking forward to new WCC collection, so I could sell some unwanted starcoin items, but for collection this small, I could eventually afford to get it all. (Well, not guy clothes.) Anyway, we got 2 dresses, pretty similar, also a kinda large clutch bag, some sandals, and male outfit. Perfect for people who love to dress elegant, or people who have starcoins just laying there useless. I love it, but I really wish we got full collection like last time. And the same day, a bit later, Stardoll finally announced MSW15 semi finalists who made it to the round 2 of the contest. On Wednesday, Stardoll released new Callie's Picks collection, named "Fall Essentials". Yeah, I am sure you already guessed the theme of the collection. Dominant colors are earth tones, with some bright colors. We have many coats, and we got some really nice bags (superstar/royalty only some), ankle boots (which I love in real life), some scarves, etc. Not a huge fan, and I am refusing to accept Fall is there and am dressing my doll in Spring/Summer clothes. The same day, Stardoll announced October HotBuys. Other than that trench coat, I don't see anything item I would be wearing. And what's with that fur? And boots? Weird. 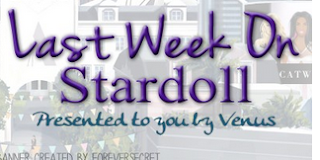 Weird shapes, colors, patterns - no offense to Stardoll, but I ain't fan of those hotbuys. Just not my type. Many would disagree with me, but that is just my opinion, can't wait to see what will you all come up with. And on Friday, new Bonjour Bisou collection. Kinda nice collection, with several denim items, which I love, and also white short pants, kinda similar to ones in latest YH collection. Items are ok, great for Fall outfits, etc. There isn't nothing much to write here, so I'm gonna wrap it up. I hope you enjoyed the week, and thee are some really nice things coming tomorrow, according to latest spoilers. Until then, vote, comment, and see you next Sunday.